Our society was designed from the ground up to accommodate the needs of able-bodied individuals, so there are times when everyday situations can become a struggle for those who are deaf. There are barriers to basic access that limit the rights and freedoms of those who can not hear, subtly perpetuating an existing structure of oppression. Even with all our modern technology, progressive innovators have failed to address some of the real problems that persist when it comes to accessibility. Below are 5 accessibility issues that could use more attention in 2018. 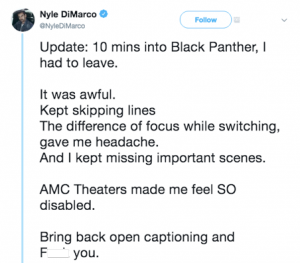 This past month, actor and activist Nyle DiMarco tweeted about his unfortunate experience at AMC Cinemas after attending a screening of the much anticipated Black Panther movie. Frustrated with the wild inconsistency of the captioning, which was dropping entire blocks of dialogue, DiMarco left the theater only ten minutes into the film. Hundreds of other deaf individuals joined DiMarco’s Twitter thread to share their own stories of failed captioning systems and culturally incompetent employees at cinemas; most concluding with a resignation that movie theaters are still not friendly places for deaf or otherwise disabled patrons. Movie theaters are a place of public accommodation where people from all walks of life are entitled to share an experience. A culturally significant film such as Black Panther, or a film that elicits rabid fandom like the Star Wars series, can be meaningful to people’s lives. Everyone deserves to share in that excitement and collective social moment if they so choose. The closed captioning devices that deaf movie-goers are given to use make it difficult to focus on both the film, which is in the background, and the screen, which is in the foreground. The constant shift in focus can be exhausting, and can also cause the viewer to miss a great deal of the action in the movie. Captioning glasses offer a similar experience. When reading tweets in the thread started by DiMarco, it becomes clear that open captioning (with the transcript right on the screen) is the preferred accommodation for deaf audiences. But movie theaters do not want to scare off the much larger audience of hearing people by offering all showings with open captions. Captioned showings are offered infrequently, typically at odd times, and there are even reported instances of movie theaters actually turning off the captioned version after hearing viewers complain. We live in a time of liquid HD film and 3D IMAX cinematography and hologram performers, but deaf people can’t just enjoy a simple night at the movies. Wouldn’t it be great to see an elegant technological solution that meets the needs of deaf audiences while maintaining appeal to mainstream patrons? Although its true that programs like text-911 and text emergency alerts are beginning to roll out across the country, they are still embarrassingly unreliable considering the availability of technological resources in this era. 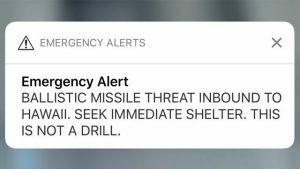 Emergency management systems continue to malfunction, for example the alarming recent false missile alert that was sent out to mobile phones in Hawaii, which was not corrected by a follow-up text for a full 38 minutes. Those who can hear have more immediate access to updates during emergency situations, which literally places deaf people at a disadvantage for survival. What kind of innovative modern federal emergency alert and management solutions could be created if this issue was granted the kinds of intellectual resources, research funding, and priority that it deserves? This is a fact that was for too long hidden, covered up, and denied, so it deserves to be repeated with great frequency: people who are d/Deaf deserve full access to the cultural arts! People who are deaf deserve access to every moment of shared collective joy, pain, awe, introspection, and outward rage that can be elicited through performance. To deny a person this experience is to deny them access to the very culture in which they live and the possibility of meaningful human connection. From Broadway shows, to the national anthem at a baseball game, to a pop concert, and everything in between, each and every person in attendance should be able to share in the energy. This is an accessibility issue that can be resolved without the use of robotics or engineering! For those who use ASL to communicate, a properly placed, qualified sign language interpreter is the best option for full access, and if possible, hiring a deaf interpreter or trained performer. Yet there remains a stubborn set of barriers when it comes to access for the performing arts, namely a lack of cultural competency when it comes to accommodating a deaf audience. Often those organizing and hosting cultural events overlook their ADA obligation to provide equal access when creating a budget for the production, then find themselves scrambling to find the funding for accommodations. Performing arts are an outlet for self expression; a way to explore complex human emotions and taboo topics. Theaters, venues, and even musicians themselves are being pressured to evolve to meet the demands of culturally aware audiences, who value inclusion. The rights of deaf inmates are extremely limited and often violated. There are thousands of deaf prisoners all across the country — a number of them wrongfully convicted — yet less than 10 prisons in the United States have video phones. 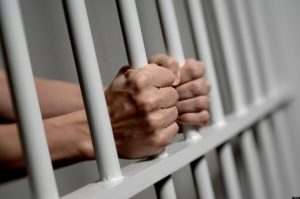 Inmates are routinely denied access to their families, friends and legal counsel because effective communication technologies are not present, or because the staff does not know how to operate or “supervise” calls on the outdated and unreliable equipment. Incarcerated deaf people grow increasingly isolated. As inmates, deaf people are left out of orientations and safety meetings, and denied possibilities for social interaction. Prison televisions without captioning remove yet another line to the outside world. Deaf prisoners are denied access to post-secondary education and extracurricular activities. The end result is emotional withdrawal and deteriorating mental health. The increase of civil rights activism in our country paired with the constant evolution of technologies could truly benefit prisoners who are deaf. Technological developers seeking a way to “give back” or solve a real social problem should consider assisting this extremely marginalized and silenced segment of the population. It’s hard to believe that it’s 2018 and we still haven’t found a consistent and effective means of communicating time, gate, and route changes for major transportation methods. Deaf people still frequently miss train and plane announcements, which often happen at the last minute. Visual notifications at airports can lag, and airport staff are not all trained to be culturally aware when interacting with a lost passenger who is deaf. Transportations apps are great in theory, but in-practice they’re often glitchy, not updated in real-time, or cannot be accessed while traveling underground. This not only impacts deaf passengers. For example: if a flight boards 30 minutes early, any passengers who have just stepped out to get some fresh air or who are in a smoking area can very easily miss the overhead announcement. Transportation companion apps are rarely innovative or even user-friendly. 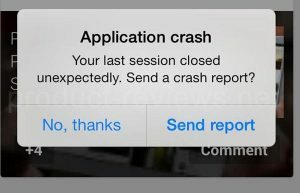 Sometimes the apps work smoothly and as intended, then other times the apps crash or close out at critical moments, leaving travelers without the tools they need. For passengers who can not hear, this can be very confusing and frustrating. If airlines and public transportation companies hope to regain the numbers they continue to lose, they may want to make a serious investment in the way they digitally connect with passengers. Making transportation a seamless and integrated experience in people’s lives can help more people experience the benefits of traveling. 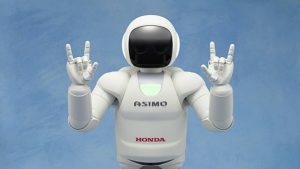 Intricate robotic communication devices, such as “sign language gloves” and intuitive interpreting apps, have always captivated the minds of innovators looking to help bridge the gap between the deaf and hearing world. If advanced to a stage of development where they functioned as intended, these types of devices would offer an interesting new option for deaf and hearing individuals to communicate in one-to-one, or maybe even small group settings. However, most people who are actively involved with the deaf community know that navigating the language barrier during calm, planned personal interactions isn’t the most pressing accessibility issue that people who are d/Deaf/Hard of hearing face. Perhaps before developing all sorts of high-tech “solutions,” ambitious innovators could slow down and take a moment to understand the real problems faced by the deaf and disabled communities. They could help to level the playing field for these communities moving forward. By creating genuine connections with the people that they hope to help, socially-minded individuals in the STEM fields can truly begin to change the world. I can recall a number of times throughout my childhood when my mother and siblings were turned away from receiving medical care simply because they were deaf. Sometimes they would arrive to a scheduled medical appointment where there were just no interpreters or accommodations, or other times they’d be denied the opportunity to even schedule an appointment. 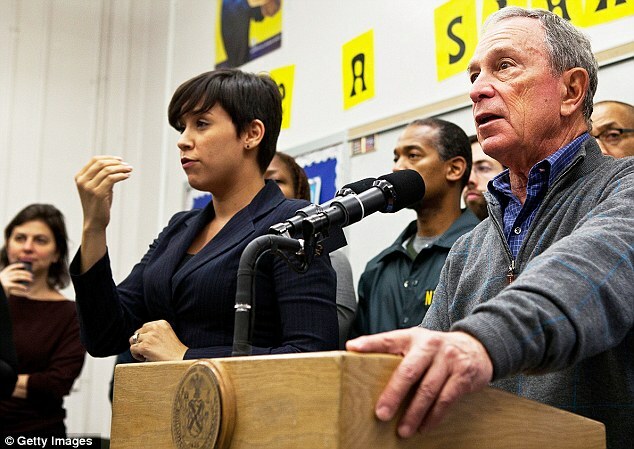 The person at the desk would tell my mother that their office wouldn’t accommodate the needs of deaf patients, and perhaps offer a referral to an office located all the way across the city. Not only are these practices totally illegal, but it is a form of oppression, and it unfortunately still happens today. Despite the Americans With Disabilities Act (ADA) being law for more than 25 years, deaf individuals continue to face difficulties when seeking medical care. In 2014, a woman in Washington State arrived at the hospital for a planned induced delivery only to discover that her request for an interpreter had not been fulfilled. When the delivery became complicated and a cesarian section was necessary, the woman struggled to comprehend what was happening. Less extreme situations commonly go unreported. A deaf person who needs to see a doctor but gets turned away at the desk might get upset and frustrated, then just book an appointment somewhere else— but it would be well within their rights to bring a lawsuit against the doctor’s office for violating Title III of the ADA, which guarantees equal access to privately owned places of public accommodation. For the most part, medical office staff do not maliciously engage in oppressive behaviors toward deaf patients. The disconnect is typically a general lack of knowledge. It should be a priority for office staff and medical practitioners to understand deafness, as more than 15% of adults in America are living with some level of hearing loss; and more than 25% of people over 65 have disabling hearing loss. To help create positive relationships with deaf patients, medical office staff can familiarize themselves with a few basic communication strategies. 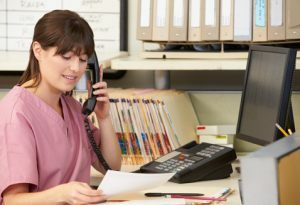 Often, the first frustrating hurdle to medical care occurs when the deaf patient calls the medical office to schedule an appointment and the receptionist hangs up on the relay call, thinking it’s a telemarketing call. Do NOT hang up on relay calls! Receptionists should be trained to recognize a call from a relay service and feel confident engaging with the deaf consumer in this way. Some deaf people are able to read lips, but it’s not safe to assume anyone’s comfort with this method. 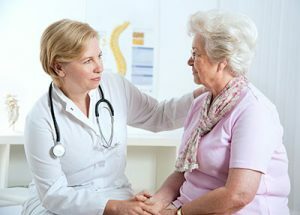 Lip reading is generally not a reliable means of communication in a medical setting, unless the deaf individual explicitly indicates that they would prefer to receive their medical information using oral communication. Studies have shown that even the very best lip reader can only capture about 30% of what is being said. Always defer to the patient’s preferences. If a deaf patient is in the office, notes can be a good way to communicate short, simple ideas. When interacting with a deaf individual, medical staff and providers should have a pen and paper available, or opt for digital using a smartphone or tablet to write back and forth. This can be a great way to ask the deaf person how they prefer to communicate, if they have their insurance card, or when they would like to schedule their next appointment. Notes may be a preferred method of communication for some late-deafened or hard of hearing individuals. 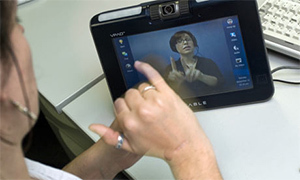 However, for those who use American Sign Language as their primary form of communication, notes are not an effective way to discuss symptoms or deliver a diagnosis, since ASL is a unique language that doesn’t translate directly to English. If a deaf person who uses ASL arrives to the office and an interpreter has not been scheduled, office staff may use notes to communicate regarding the patient’s interpreter preferences and reschedule the appointment. 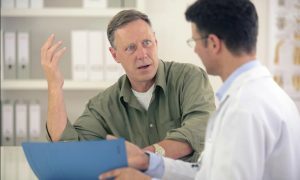 Medical professionals must avoid pressuring deaf patients to proceed without an interpreter, as this can open up a potential liability. Staff members and medical professionals should remember to keep checking in every step of the way to make sure the patient remains engaged. If one communication strategy doesn’t seem to be working, work together with the patient to create a more effective strategy. Under the ADA, it is the obligation of the medical service provider as a public entity to offer equal access for all citizens. For those who identify as ASL users, the most reasonable accommodation is usually an interpreter. Every medical practice, without exception, ought to have a current contract on file with a reputable local interpreting agency. Deaf-owned or interpreter-owned agencies are preferred because they offer higher quality services with a focus on consumer satisfaction. Be prepared! 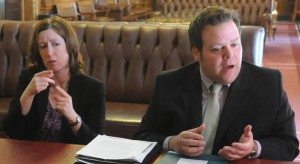 The ADA has been law for more than 25 years so the funds for accessibility services should be allocated into the operating budget; financial hardship is difficult to prove. When requesting services, it is advised to provide as much information as possible to ensure a good interpreter match. Note that interpreters do book up in advance, so it is ideal to make the request with at least a week’s notice to secure coverage. Utilizing a deaf patient’s family members or medical office staff as interpreters is a HUGE no-no, and a liability lawsuit waiting to happen. Medical interpreters are trained professionals with specialized vocabularies, they navigate both linguistic and cultural barriers using an established code of ethics. If staff members at the medical office happen to know sign language, they should only utilize it to converse with deaf patients if they are fluent. A person seeking medical care does not necessarily want to help the receptionist practice their ASL. If a staff member is not a licensed interpreter, it is not appropriate for them to provide sign language interpreting services, nor is it appropriate for the family members of deaf patients to provide interpreting services. 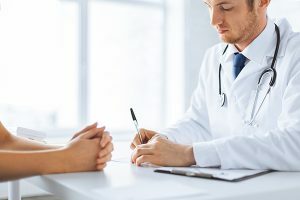 Cultural competency training offers exciting opportunities for medical providers and support staff to connect with a segment of the population that has for too long been forced to the sidelines when it comes to their own healthcare. A comprehensive training program led by deaf panelists can provide employees of a medical practice a safe space to work through common misconceptions, break free of stereotypes, and consider new perspectives. As a professional development program, cultural competency training helps employees understand their legal responsibilities, and cultivates a deeper sense of compassion. For medical providers and employees within the medical care industry, of course people are the first priority. By laying a foundation of cultural understanding, it’s easy to build a successful practice that attracts diverse members of the community, and to earn a positive reputation for accessibility. LC Interpreting Services is thrilled to offer Cultural Competency Training seminars for businesses and organizations, including medical practices. Working with a set of d/Deaf consultants, employees at all levels can deepen their understanding of deafness, Deaf culture, and d/Deaf communication to effectively bridge the persistent gaps that exist. Deaf and Hearing World: Bridging the Cultural Gap Cultural Competency Training is an excellent solution for progressive companies ready to take it beyond basic communication. When interviewing for a job, you only get one chance at a good first impression. You try to wear the right clothes, mentally prepare, and hope you have all the right answers. But what if none of that mattered? What if you didn’t get the job because of the color of your eyes? Or because you were too tall? In 2014, this kind of hiring discrimination might sound absurd, but for deaf job candidates it is a difficult reality. Title I of the Americans with Disabilities Act gives deaf individuals legal protection against discriminatory hiring practices. According to this section of the ADA, an employer may not use ones’ deafness as a basis for not hiring, not advancing, or terminating employment status. Qualified deaf applicants must be considered for career opportunities, so long as they meet the skill, experience, education, and other job-related requirements of a position– with or without reasonable accommodation. Most hearing people rarely think about deaf accommodations. When it comes to hiring deaf employees, they are concerned that it will be a costly or inconvenient process. Potential employers might worry that communication will be challenging, and the deaf employee will have trouble integrating with the team. These fears are unfounded, and they usually stem from inadequate corporate cultural sensitivity education. The bottom line is that hearing employers simply don’t understand what it means to be deaf, and so it seems easier to just hire a hearing person… even if they are less qualified for the job. This is discrimination, and it’s sadly commonplace. 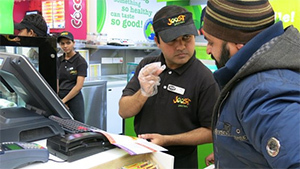 The first step to hiring a deaf employee is opening a comfortable line of communication. Not sure how? Just ask! Deaf people spend their whole lives learning to interact with mainstream culture, and each person does it a little differently. Some deaf people prefer written communication, others are ok with reading lips, and still others prefer an ASL interpreter– there is no one-size-fits-all solution. Trust me, you will not offend your deaf interviewee by asking him or her what type of communication they like to use! When you decide to hire a deaf candidate, some workplace adjustments will need to be made. Your training videos should already be captioned; if they are not, you can have them captioned for a very reasonable fee. According to the ADA, it is the deaf individual’s responsibility to inform an employer where accommodations are needed. Employers are obligated by law to make any “reasonable accommodations” which enable their employee to work effectively. Most of these adjustments will depend on the person’s individual preferences. Not sure? Just ask! Businesses must provide deaf employees with the auxiliary devices they need to communicate equally. With unlimited access to email, text, and chats, it is easier than ever to make your workflow deaf-friendly. Generally, the most important device will be a video phone. Businesses can obtain video phones and Video Relay Services for free, VRS providers are reimbursed by the Interstate Telecommunications Relay Service Fund. 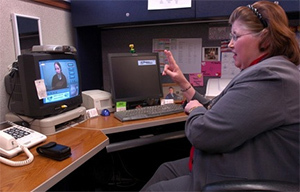 Using the VRS, your deaf employee is connected with a communications assistant through video chat. The video interpreter will engage with the deaf person using their preferred modality, and vocally interpret for the hearing parties. This means that when a hearing client, manager, or coworker needs to discuss something with a deaf employee, they can just use the VRS to quickly and conveniently do so; whether they are across the country or just across the hall. For meetings, you will need to enlist a deaf service provider– either a captionist or interpreter. Meetings can be very involved and fast-paced. Even the most expert lip readers have difficulty keeping up when there are 20 people in the room discussing things out of turn. You want everyone in your organization to feel like their participation is valued, so be sure you ask your deaf employee how you can better facilitate this. When hiring an interpreter or service provider , be sure to submit your request as far in advance as you are able. As far as cost concerns, there are specific Federal tax credits and tax deductions available to employers, and you will find there are also other public and private sources of funding available for ADA required accommodations. This means service providers and equipment charges can often be reimbursed at little cost to your business. Equality starts from the top down. Diverse leadership promotes social tolerance, and we are finally beginning to see deaf officials in major institutions such the White House and the FCC. When business owners, executives, and managers become educated about multicultural issues, the entire organization benefits. When your staff understands how to integrate a deaf individual onto the team, you are helping bridge the cultural divide and create true equality. LC Interpreting Services is available for on-site and event interpreting in the greater NYC area. Along with providing quality interpreters and excellence in service, I offer complimentary cultural sensitivity training for your organization. Let’s work together to make your business a place where diversity thrives.